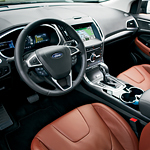 If you're looking for a vehicle that's smart enough to help you out on the road, take a look at the new Ford Edge. This admired mid-sized SUV is available at Victory Ford with advanced safety technology. One of the most unique features you can get is the Adaptive Cruise Control system. You will appreciate the versatility this system offers. It uses smart sensors to monitor the flow of traffic and look out for potential obstacles. Once initiated, the Edge will automatically adjust its speed to follow the flow of traffic. It's capable of coming to a complete stop in high-traffic situations. The Adaptive Cruise Control system is also available with a convenient Lane-Centering feature that drivers in Kansas City will love. In addition to monitoring traffic, the system will read the lane markings of the road you're on. The Edge can then provide light steering guidance to keep you in the center of your lane.